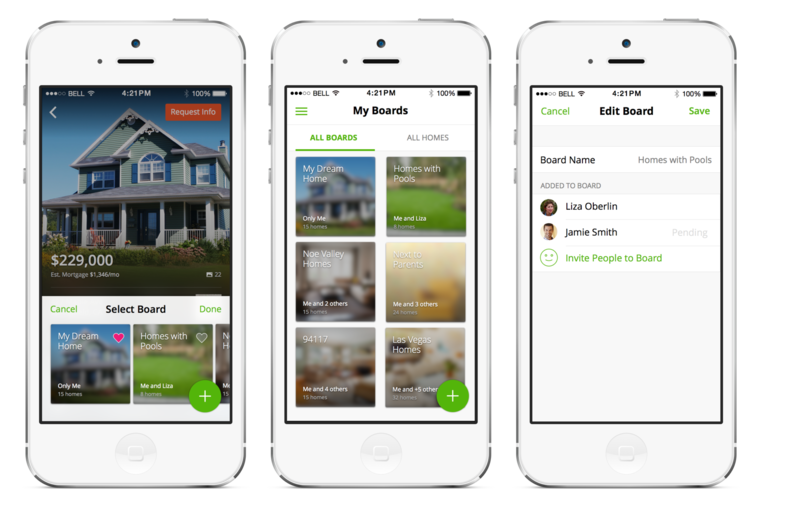 A new collaborative home search feature from Trulia allows homebuyers and renters to create Pinterest-like “boards” of homes they find on the portal that they can keep track of and share with friends, family and their agent. When consumers who are logged into their Trulia account save homes (by selecting the heart icon that lives next to a listing on a search results page or at the top of a property detail page), they have the option of organizing them into different collections. They can then share those collections, or boards, with different sets of people. Users are notified in real time via email as soon as there’s an update to a listing on a board they’re following. They also get updates if a listing is added or taken away from a board. Screenshot of how Trulia’s collaborative search feature shows up on mobile. Currently, users can’t share notes on homes within the new collaborative search feature, but that functionality is coming in the next few months, Trulia spokesman Matt Flegal said. The search tool will also soon have a real-time chat feature. Collaborative search has become a popular tool in real estate. Trulia’s new owner, Zillow, however, shuttered its own collaborative search tool, Agentfolio, due to lack of agent adoption. Agentfolio, which Zillow shut down this week, was targeted toward buy-side agents to help them collaborate with their clients to search, comment on, review and share information about homes they were checking out. It was free for agents who advertised with Zillow and available to others for $25 per month. Trulia’s search feature is geared toward consumers, and the portal is dangling cash in front of consumers to help spur usage. Anyone who creates a board on Trulia between now and April 30 will automatically be entered in a chance to win $15,000 in cash and $10,000 gift card to home decor firm One Kings Lane. Article image credited to Desktop version of Trulia&#8217;s collaborative home search tool.